Keith Hicks admired a one-bedroom apartment while touring The Union. 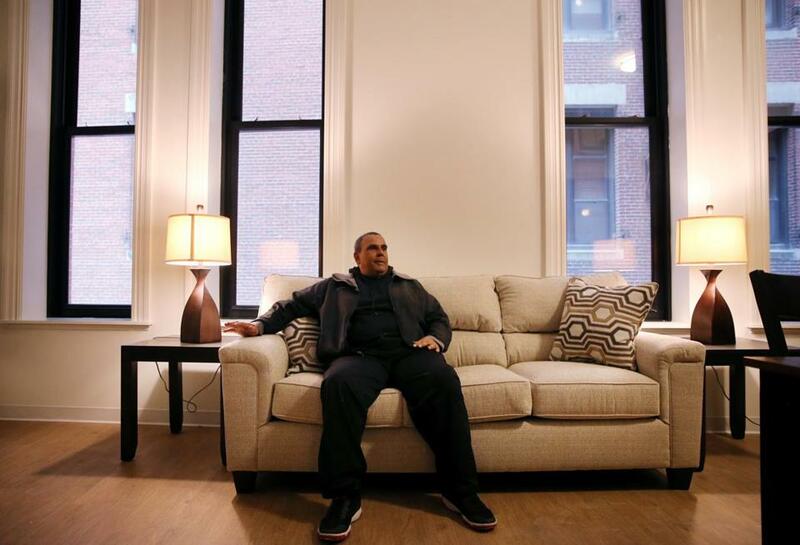 John Callaghan has spent the past four years living in a room on the upper floors of St. Francis House in downtown Boston and working at a rental car company — a world away from the 10 months he spent in emergency homeless shelters after losing a longtime job at a city hospital. Next month, the 62-year-old Callaghan takes the next big step, even if it’s just a move across the street. He is among 26 homeless or formerly homeless people who will be moving into affordable apartments at what was the site of the Boston Young Men’s Christian Union on Boylston Street. Construction on the project, which was organized by St. Francis House and the Planning Office for Urban Affairs Inc. is winding down and residents are expected to begin moving in next month. When fully occupied, the historic building dubbed The Union will feature 46 affordable apartments, administrative offices for St. Francis House, and a dog day care and pet supply retail shop. “It’s the gift that keeps on giving because it has so many components to it,” said Lisa B. Alberghini, president of the Planning Office for Urban Affairs, which is affiliated with the Roman Catholic Archdiocese of Boston. The apartments have high ceilings and large windows, some with views of Boston Common. Bob’s Discount Furniture donated the furniture and each unit has a kitchen and private bathroom. There are eight one-bedroom units and 38 studio apartments; some of the units have fireplaces. Monthly rents vary depending on the apartment size and whether the tenant has experienced homelessness, the developers said. For example, rent for the 20 units set aside for residents who have been homeless is capped at 30 percent of their income, the developers said. Another 20 units are for households that earn no more than about $43,000 annually. 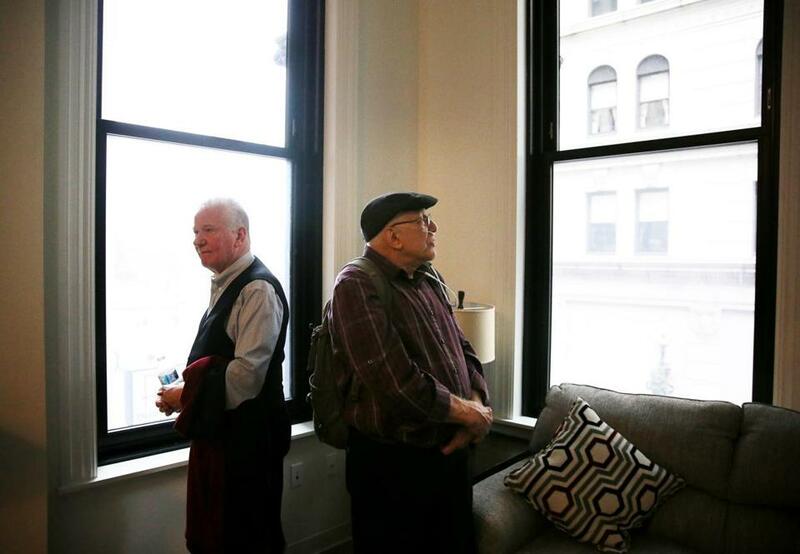 John Callaghan (left) and Brian Richard admired a studio apartment while touring The Union Saturday. St. Francis House plans to move its administrative offices into the five-story building in March, freeing up space at its property across the street for counseling services, said Karen LaFrazia, executive director of the nonprofit best known for its day shelter. The dog day care, a first for the neighborhood, is expected to open in May with help from an established dog day care in the South End. An apprentice program focused on dog grooming, training, walking, and retail is planned to launch in September with 26 slots for St. Francis House guests, LaFrazia said. The dog day care and pet supply retail shop is a way for St. Francis House to enhance the neighborhood, LaFrazia said, while providing a career opportunity with growth potential to people in need. The project has been in the works since 2015 when St. Francis House and the Planning Office for Urban Affairs partnered to purchase the building, which was constructed during the 19th century and has been designated a city landmark. The late James Francis Sullivan Sr., a real estate developer and benefactor of St. Francis House, gave the organizations an $8 million loan with favorable borrowing terms to buy the property, which housed a gym and offices, Alberghini said. The construction costs were about $20 million. The city said it chipped in $4 million, while the state provided another $4 million plus a package of low-income and historic tax credits, according to Alberghini. Mayor Martin J. Walsh toured the building Saturday afternoon with representatives of the development team and three future residents, including Callaghan. The property could have easily been transformed into luxury condominiums that would have generated hefty profits for a developer, Walsh said. In the last three years, the city said it has found homes for 900 homeless veterans and 650 people who were considered chronically homeless. Boston’s Way Home Fund , a city initiative announced in January , has raised $5 million to pay for rental housing to those most in need and provide services to build life skills, Walsh said. “Our goal is to end chronic homelessness,” he said. Brian Richard, 70, who is moving into the building from St. Francis House, said he is looking forward to having his own bathroom and kitchen. “It’s all the little things that people don’t think about,” he said. Keith Hicks, 61, who is moving in after nearly seven years at St. Francis House, said he is eager to have his grandchildren visit.